That is a line (admittedly the edited version) from rapper Wiz Khalifa on a song he was featured on a few years ago. I must admit, that line actually rings true for me. My friends and co-workers have often never seen the press cars I pull up in before. Either they are significantly updated models, completely redesigned or all-new. And everyone loves that they are among the first to see brand new cars in the flesh and are quick to offer their opinion on its style. 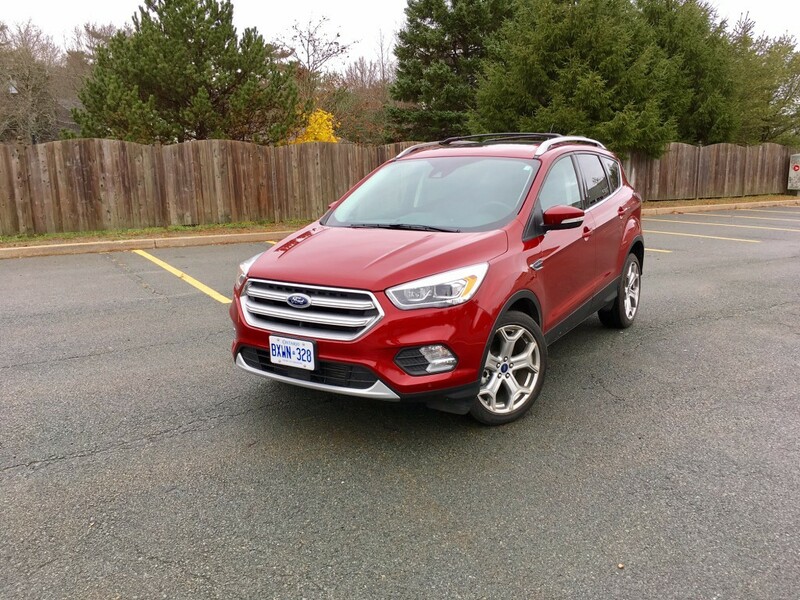 But it was different this time with the refreshed Ford Escape. People barely noticed. Then it became obvious why. 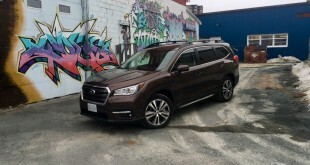 Escapes are everywhere in Nova Scotia and indeed in Canada. It doesn’t matter what model year it is, you will see plenty – even the recently refreshed version that I was driving, which has only been out for a few months – already has lots of copies on the road. In fact, I noticed so many brand new Escapes that I even came across two that were identical to my press car – same trim, same colour. That is fairly rare. I suddenly knew what it felt like to be a Honda Civic owner or a Ford F-150 owner. So, clearly these things sell in large numbers for a reason, but the segment in which it competes is vast and fierce. These compact crossovers are the new mid-size family sedan. No matter which model year, the general consensus is that Ford got the styling right. The only real controversy was when Ford completely stepped away from boxy styling for the previous generation. That Escape still sold well though. This refreshed version adds a bit more corporate styling with a refreshed grille, head and tail lights, as well as new wheel designs. LED tail lights are now standard. It’s surely handsome, but if you are looking to stick out in this segment – and indeed from other Escapes- you likely won’t. The interior gets a refresh as well with a new steering wheel design along with a shifter that is placed in a more traditional spot as opposed to being tacked into the dash. There is also no traditional hand brake. Instead, there is an electronic break. This frees up room for bigger cup holders and more cubby holes. Fit and finish is acceptable though if you go looking for them, you will find a few cheap bits. 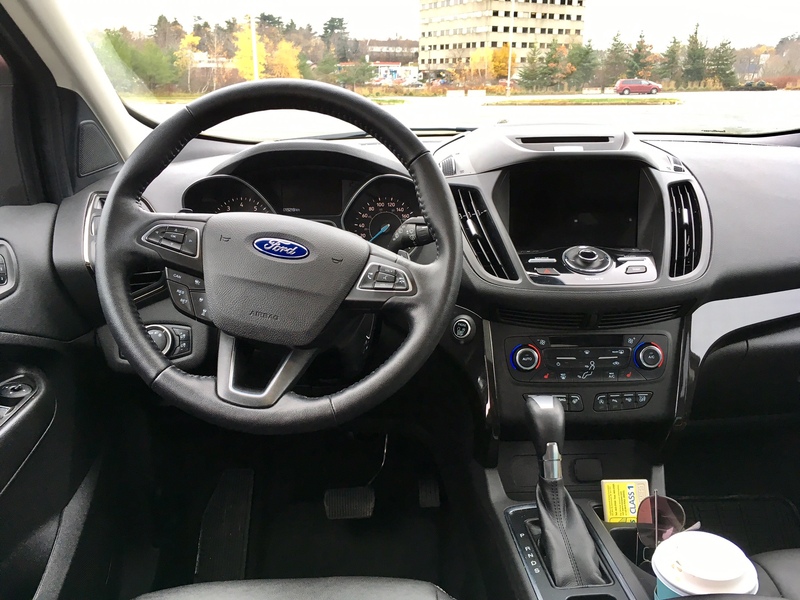 The Escape is equipped with Ford’s updated infotainment system known as Sync 3. There is no question that it is miles, er, kilometers ahead of the old system. It has a more logical layout, it’s easier to read and response to commands is quicker. Of all the crossovers in the segment, the Escape finds itself outdone by some notable competitors in terms of interior space. 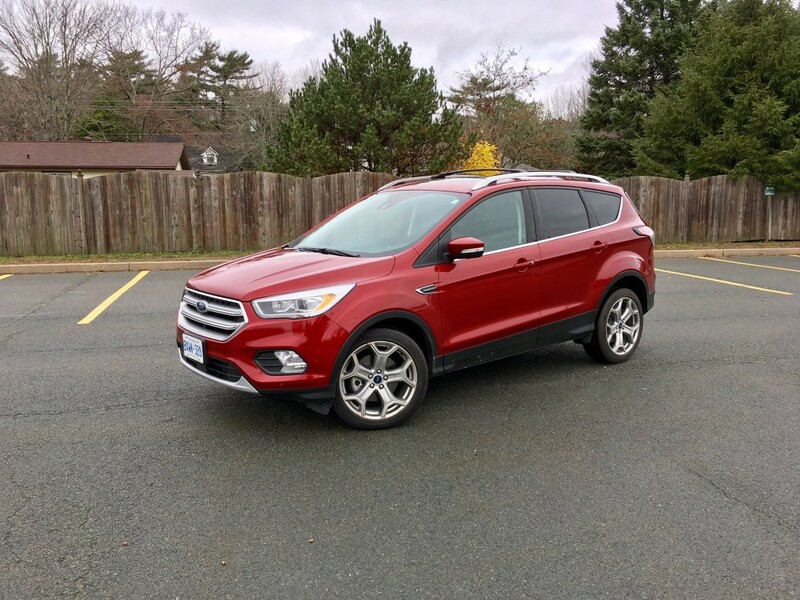 That isn’t to say the Escape feels cramped, but its interior and exterior dimensions are smaller than say, a Chevrolet Equinox or a Toyota RAV4. Indeed cargo area seemed lacking as it look lots of Tetris-like moves to house one large suitcase, a carry on and backpack when I picked my aunt up at the airport. I almost gave up and was going to fold the seats, but managed to squeeze them in at the last try. If cargo room is high on your priority list, this is something to take note of. There are three engine options for you to choose from depending on which trim you opt for. 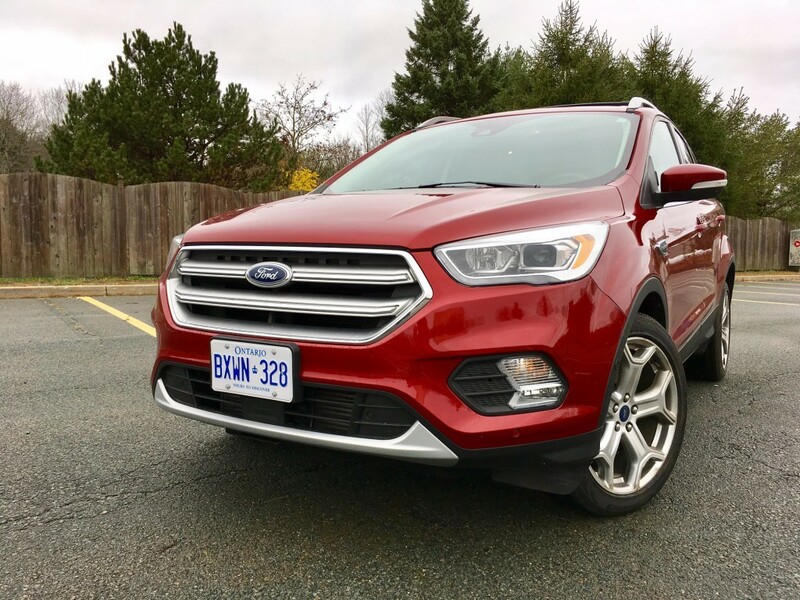 The base S trim gets a 2.5 litre 4-cylinder – but you can’t get all-wheel drive, and to be honest, this is an older engine that will likely disappoint. 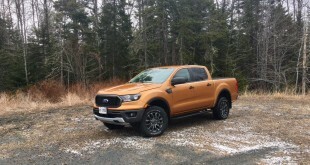 If you move up to the mid-trim, you’ll get a 1.5 litre turbocharged (Ford calls turbocharging ‘Ecoboost’) 4-cylinder with all-wheel drive optional. 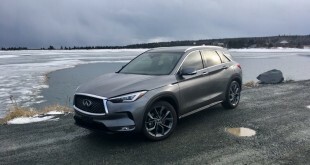 If you opt for the top Titanium trim, like my tester, you get the 2.0 litre turbocharged four which nets you a healthy 245 horsepower and an even healthier 275 pound feet of torque. All-wheel drive is again optional. Let’s be clear. You don’t need the 2.0 litre, but it’s likely the one you want. It’s speedy, with plenty of get up and go that should satisfy even the pickiest of speed demons. It’s also one of the only engines available within the segment with so much power. Again, you don’t need this engine. 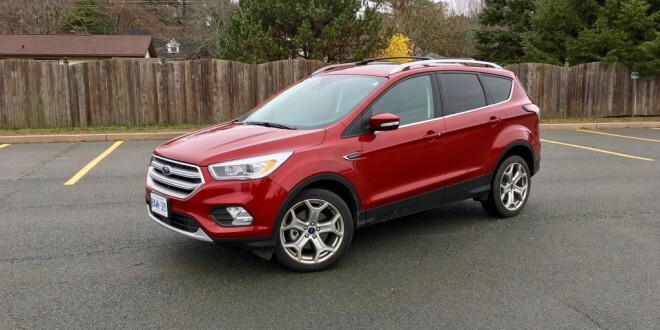 After all, most people buy Escapes as family haulers which are rarely entered into drag races. But if you’re looking for a bit of fun on the way to work after dropping the kids off at school, this engine will satisfy. 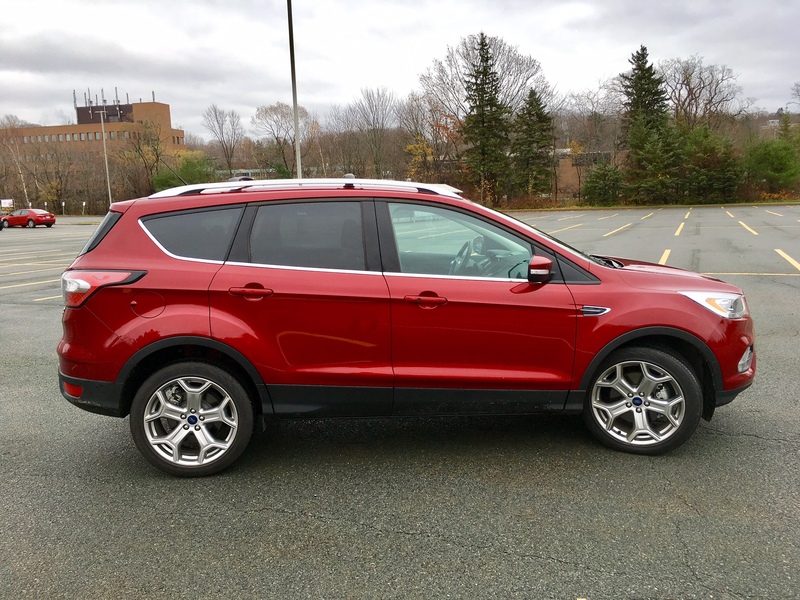 In general, the Escape is quite sprightly for a crossover with good steering feedback and little pushback when you want to change directions quickly. It’s no low-slung performance car, but considering its height disadvantage for cornering, it does well. Same goes for on the highway where it incorporates a steady and sturdy feel all while maintaining acceptable levels of comfort. 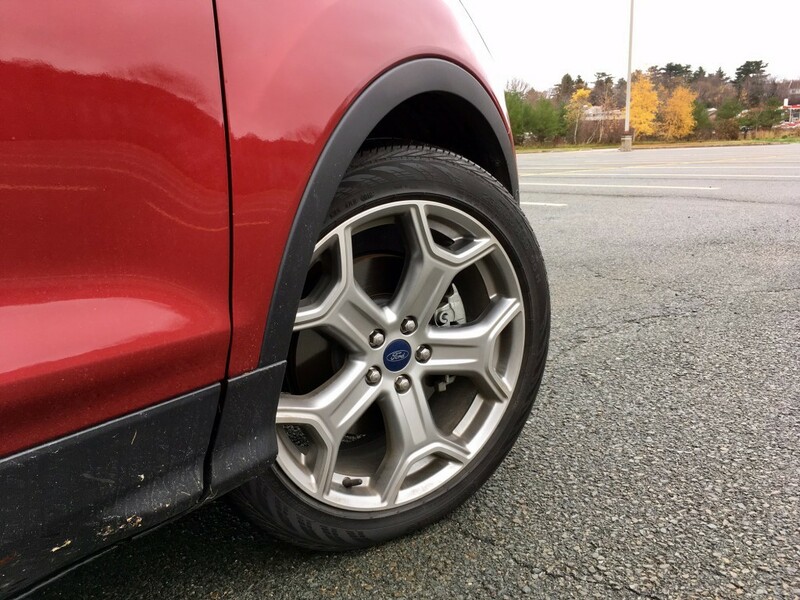 If you hit a pothole, the suspension will sort it out nicely however the 19-inch wheels are what cause a bit of a jolt. Being the top trim, there are a host of safety gizmos to keep you, and it, in one piece during the journey. 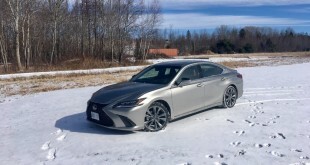 The all-wheel drive system wasn’t noticeable for most of the time, but that’s because it’s the type of system that only engages when it has to. And thanks to a lack of snow, rain or off-roading, I wasn’t able to really get a sense of how the system handled those situations. Officially, the Escape with the 2.0 litre engine is rated at 11.5 L/100 kms city and 8.7 highway. That city number isn’t the greatest, but I was still able to beat it in mostly city driving at 11.1 L/100 kms. This is the price you pay for the fun engine. Unfortunately you need to decide which is the higher priority while shopping. Though it seems the majority has already made up their decision while shopping. 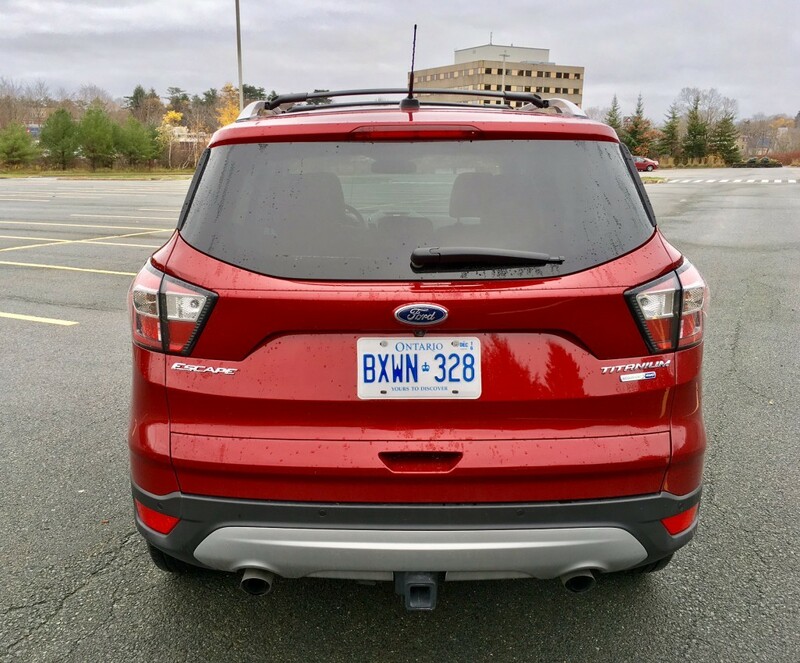 So far this year, Ford has sold close to 40,000 Escapes in Canada, which is why you see them everywhere. Clearly they are doing something right, which may suggest that Canadians put some sort of value on performance, since the Escape is clearly near the top in that category even though it isn’t near the top in terms of efficiency, and interior space – something that is typically top of mind for the crossover buyer. Strange indeed.